Wilbur Munro Leaf is best known for his beloved book, The Story of Ferdinand. It’s the tale of a peaceful yet rebellious bull that would rather enjoy the flowers in his meadow than fight in an arena. Munro Leaf and his friend, award-winning artist, and writer Robert Lawson, had been talking about the kind of book they would want to write if they could get past the publisher’s ideas of what made a good book. It took him less than an hour - “25 minutes on a rainy Saturday” - to scribble down the story on a yellow pad of paper. With Lawson’s illustrations, the beatific bull was on his way to becoming internationally famous for his peaceful message in 1936 - a time when the world was coming apart in war. Some people didn’t like Ferdinand. Several groups banned it as being either Fascist, satirical of pacifism, or “red propaganda.” Hitler ordered the book to be burned, while Communist dictator Josef Stalin made a special exception for it to be allowed for school children in Poland. 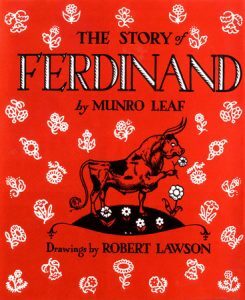 * But The Story of Ferdinand kept being published year after year, earning its place as a classic children’s book and an Academy Award-winning short film from Walt Disney. In 2017, Blue Sky Studios from Twentieth Century Fox Home Entertainment released a full-length feature film about Ferdinand, starring the voice talents of John Cena and Kate McKinnon. Munro Leaf’s other well-known children’s book, Wee Gillis, received a Caldecott Honor for Robert Lawson’s illustrations. Wee Gillis is a Scottish lad whose mother’s family lives in the Scottish Lowlands. They raise long-haired cows and think his father’s relatives - Highlanders who stalk deer in the craggy hills 0 are the silly ones. But the Highlanders think the Lowlanders are just as silly traipsing about after cows. When he grows up, Wee Gillis must choose which life will be his. To help him decide, he spends a year with each set of relatives where he learns some important things that will make his final choice much easier. Besides these two books, Munro Leaf also wrote quite a number of volumes that taught good manners to children, such as Brushing Your Teeth Can Be Fun…And Lots of Other Good Ideas for How to Grow Up Healthy, Strong, and Smart and a series of cartoons called The Watchbirds, which also taught proper behavior. Work: Belmont High School, Belmont, MA, teacher and football coach, 1929-31; Montgomery School, Wynnewood, PA, teacher and football coach, 1931; Bobbs-Merrill Co., New York, NY, manuscript reader, 1932-33; Frederick A. Stokes Co., New York, NY, editor and director, 1932-39; author and illustrator, 1934-76. These are available through CRRL’s subscription database, Biography in Context.